Tablo 9.7 tablet review - we have reviewed couple of Tablo tablets so far and honestly they didn't show any stunning qualities. The small Tablo 7 tablet had the advantage of the low price tag and small size but that was all. The Tablo 9.7 is another story, it offers plenty of good features and specifications which make it pretty usable tablet. First of all we are going to start with the hardware used in this tablet. 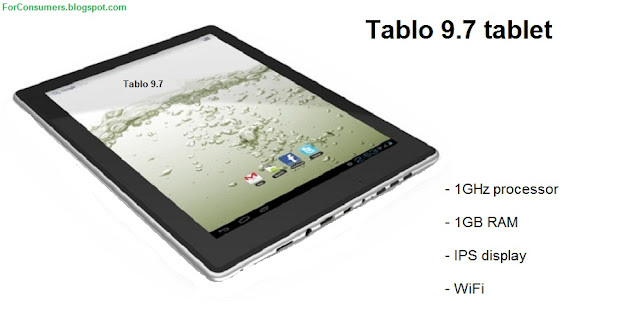 Tablo 9.7 has 1GHz Cortex A8 processor (Dual Mali-400/GC800 graphics accelerator) and 1GB of DDR3 RAM. The space for storage is 16GB, expandable with up to 32GB more with an additional microSD card. One of the nice features in the Tablo 9.7 tablet is its display. The huge 9.7-inch IPS LCD capacitive multi-touch screen has resolution of 1024x768. As being an IPS display it performs much better than standard displays with bright and clear images and good visibility in direct sunlight. Connection options in the Tablo 9.7 tablet include 802.11b/g WiFi connection, mini HDMI 1.4 port and micro USB port. The tablet also has a 3.5mm headphone jack. Multimedia features in the Tablo 9.7 include 0.3 megapixel front and 2.0 megapixel rear cameras with mic. The tablet also has built-in G sensor for gaming and automatic screen rotation. Tablo 9.7 has an average battery life of around 4-5 hours of use before it needs recharging. As I already mentioned this is Google Android tablet and it runs on the Android 4 Ice Cream Sandwich operating system. Video Supported: AVI, XVID, rm, rmvb, MKV, WMV, MOV, MP4, H.264, MPEG, DIVX, FLV.HD 1080P max.